In a league that gets more and more pass-happy each year, Arian Foster represents an opportunity for a forward-thinking team to get ahead of the curve. As the nickel alignment becomes the base defense for most NFL teams, organizations around the league are acquiring and developing players with far more regard to their abilities defending against the pass than their performance against the run. In the old days, going three wide on offense forced a defense to bring its weaker players onto the field. Now, offenses are beginning to realize that they can do that by going with heavy formations, packing the line of scrimmage, and using an intelligent runner to pick apart teams used to dropping back at the snap. Just as the NFL fluctuates between moments when the 3-4 and the 4-3 are in vogue, the league will continue to fluctuate between times when passing is king and times when running the ball down the opposition’s throat is job one. A team that chooses to build its offensive identity around an effective running game in 2012 can acquire road-grading offensive linemen, ferocious tight ends, and a dominant running back far easier than it can a passing offense of similar quality. 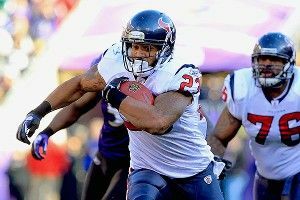 Arian Foster is the exact sort of player around whom any sort of rushing attack can be built, because he’s not just a mere running back; he’s a football player. In an era of specialized roles, absent durability, and terrible inconsistency from even the league’s highest-paid running backs, Foster is a three-down back for whom the opposition must account on every single play. And while some players use that “three-down” adjective to mask the fact that they’re not very good at their primary duty, Arian Foster has produced two of the most impressive seasons in recent memory over the past 24 months. In fact, considering that little fact about the league becoming so pass-happy, it might actually be two of the most impressive seasons in a lot longer. Over the past two years, Arian Foster has suited up for 29 regular-season games as the Texans’ starting running back. What he’s done in those games, very simply, has not been matched by anyone else in football. Across those 29 games, Foster has produced a whopping 2,840 rushing yards on only 605 attempts. Running backs just don’t do that these days. At the most basic level, we can note that Foster has averaged 97.9 yards per game during those 29 games. That’s more than any other player in football, and outside of Maurice Jones-Drew, no other player is within nine yards of Foster’s total. He’s also led the league in rushing touchdowns over that time frame, with his 26 rushing scores producing an average of nearly one per game. And among players with 400 carries or more over the past two seasons, Foster is tied for second-best in yards per carry, with only LeSean McCoy ahead of Foster’s 4.7-yard rushing average. Based solely on his performance running with the football, we can safely suggest that Arian Foster has been the most productive rusher in the NFL over the past two seasons. His numbers are even more impressive, though, when we consider them in context with what other great running backs from history have done when they were 24 and 25, as Foster was over the past two years. Foster’s 2011 performance is even more virtuous when you consider how thin the stars around him got on offense. Every running back would benefit from having Matt Schaub and Andre Johnson around them to occupy defenders, but when Schaub and Johnson (and guard Mike Brisiel) went down with injuries and missed most of the second half of the season, it was Arian Foster who stepped up to make big plays for the Houston offense. Despite playing next to a rookie quarterback and going against nine-man fronts at times, Foster’s performance actually improved once T.J. Yates got into the lineup. Those seven games without Schaub at quarterback include two playoff games in which Foster was dominant. During Houston’s playoff adventure, Foster carried the ball 51 times for a whopping 285 yards, an average of nearly six yards per attempt. Arian Foster has the mental and emotional characteristics of a team leader, and his performance backs up that story. When his team needed him most, Foster strapped the Houston offense onto his back and carried it as far as any running back could. While some great running backs are nonentities in passing situations, Arian Foster is a dangerous weapon that can create first downs out of even the slightest lapse in defensive concentration or the smallest mismatch. Over the past two years, he’s been the second option in the Houston passing game, as only Andre Johnson has averaged more catches per game than Foster. And when you combine that receiving work with Foster’s performance as a ballcarrier, well, you realize just how special a player Arian Foster truly is. In addition to his 97.9-yard-per-game rushing average, Foster has chipped in with 42.1 receiving yards per game as a pass-catching threat out of the backfield. That’s a total of 140.0 yards from scrimmage per game. As you might suspect, that’s the most of any running back in football over the past two years, but there’s more to it than that. Nobody’s been able to match that total in six years, as the last guy to average 140 yards from scrimmage per game over a two-year stretch was Tiki Barber in 2005-06. Only five players have pulled that off since the turn of the millennium, and it’s a who’s who of multipurpose threats: Barber, Marshall Faulk, Priest Holmes, Edgerrin James, and LaDainian Tomlinson. With all that production, it’s obvious that Foster is an enormous part of the Texans offense. The extent to which that is true, though, is notable. In 2010, when Foster played all 16 games, he was responsible for 35.9 percent of Houston’s yardage from scrimmage, the highest such percentage in the league. In 2011, when Foster played in 13 games, he still managed to accrue 30.9 percent of his team’s yardage, which was the fourth-highest percentage in the league. If we don’t consider the games Foster missed and replace a gritty 40-yard performance in Week 2 from a clearly injured Foster with those two playoff games, he actually gathered 39.5 percent of Houston’s yardage from the line of scrimmage by himself in that 15-game sample. Only Maurice Jones-Drew was responsible for more. Even while alongside a franchise quarterback and a world-class wide receiver, Foster has been essential to one of the league’s best offenses. While we mentioned Foster’s injury, it’s also worth noting how durable he’s been as a professional. Despite a heavy workload in 2010 and toward the end of 2011, Foster’s only notable injury during his football career has been a hamstring pull that cost him part of the 2011 campaign. Foster’s shown a hunger to play through minor injuries at both the college and professional levels, and unlike players who have been put through the wringer, Foster’s proven production has come without the damning long-term effects of an unsustainable workload. Foster has just 659 pro carries on the board, which is nearly 50 percent fewer than the 1,198 carries Adrian Peterson received through age 25 before signing his long-term extension with the Vikings and promptly suffering a torn ACL. Foster’s legs should remain fresh for years to come. If you could put together the perfect running back on paper, what qualities would you look for? You’d want a back who was explosive and capable of big plays, but powerful and patient enough to read his blocks while making the consistent gains teams need to move the chains. You’d want a player with the receiving skills to bail out a quarterback under pressure and the pass-blocking ability to prevent that quarterback from being pressured. You’d want a player who was big enough to carry the ball without concerns about overwork, but one with a low center of gravity who slips through the sorts of lazy tackles that abound in the modern game. You’d want a back with a proven history of production who was young enough to improve. You’d want a back with the skills of a first-round pick and the hunger of an undrafted player. If you could put together the perfect running back on paper, you would draw up Arian Foster. Now, thanks to Houston’s salary-cap issues and impending free agents on all sides of the ball, you’ve got one chance to get him.